My most popular stock photo. The photos for this post should be shot through a hazy filter since the story sounds impossible in light of the current state of the stock photography market and the memories are unclear. I was thinking back to when I used to make a decent income from stock photography. Yeah, like Getty Images… but different, way different – there was actually real money to be made by photographers, who are now just “content providers.” Some photographers did nothing but produce stock photography and if they were good they did VERY well for themselves. I will try really hard to make this more than just an opportunity to bemoan “the good old days” and complain about how things are today. It is just change and change is inevitable. You can’t stop progress. There was a time when stock photographs sold for real money. How much? One photograph is said to have been licensed in 2000 to Microsoft for the default wallpaper of Windows XP for a rumored “low six figures” – there is even a Wikipedia entry about it. (Image courtesy Wikipedia.) I never did that well, but I made some decent money, just a lot fewer zeroes than the fee for that bucolic photo, and zero is nothing right? My first foray into stock was when I was still living in Aspen and met with the head guy of the Globe Photos stock agency on one of my forays to New York City from Aspen to visit clients and develop new clientele. I went to the Globe offices on Seventh Avenue south of Penn Station, then a seedy area. The office wasn’t very reputable looking but the receptionist was nice and said I could find the boss in an Irish bar down the street and he would meet with me there. Really. So I did and he was there and we agreed for Globe to represent me – and then he said he wanted celebrity photos from Aspen – “Go to the bars and get shots of them drinking, eating, find them on skiis, whatever.” Which was not exactly what I was interested in. I didn’t realize that Globe was a celebrity agency that provided pictures to questionable publications such as The National Enquirer. Fail. Then I hooked up with an agency from the UK which was trying to gain a foothold in the US – Tony Stone Images Worldwide. Some people say that Tony Stone was the beginning of Getty. It was one of the first agencies to be swallowed by Getty. At that point I quit TSI/Getty since Getty was considered the devil incarnate. Then I was able to hook up with The Stock Market. It had been founded by two photographers: Sally Lloyd and Richard Steedman, who were considered trustworthy because they were long time members of ASMP – the venerable professional photographers association. Sally and Richard were truly honorable business people, and we licensed a lot of work…. well, a lot for me but I was a small fish in their agency…. but they always treated me fairly and honestly. Eventually they sold TSM to Corbis. It was controversial at the time, considered a betrayal by most of the TSM photographers. But Sally and Richard saw the writing on the wall. It was time to consolidate with a big agency or fail slowly on your own. I would have sold out, too if I had been in their shoes. They could retire and their photographers – who I believe they genuinely cared about – would have a stronger agency to market their work. The Stock Market Catalog was big. 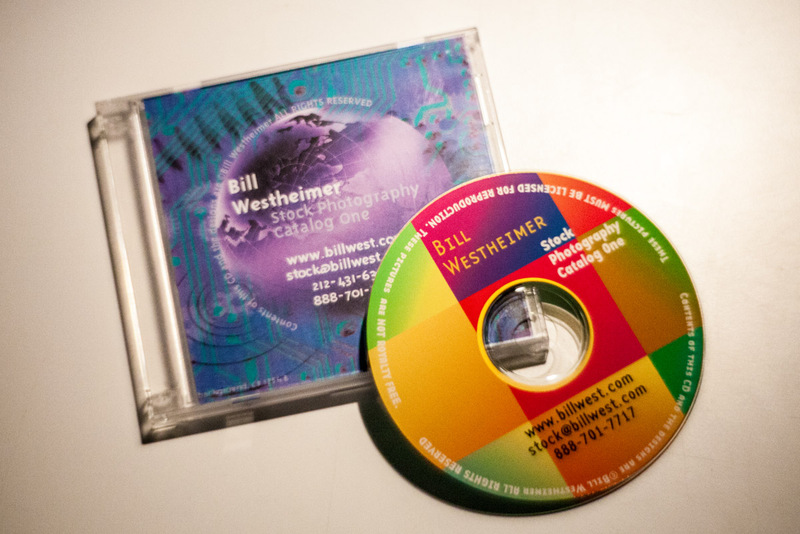 I produced a CD-ROM Catalog of my stock pictures. I even included my portfolio! One of Corbis’ first CD Catalogs was for the Westlight Agency collection they bought. There was good enough money to be made by a talented stock shooter that some photographers stopped doing assignments and self-assigned stock production. Some of the agencies even provided guidance and funding to their top producers so they could better track what was in demand and almost shoot to order – almost like working on assignment for a client. Agencies started favoring their best photographers in the search systems and the low producers like me were at the bottom of search results. Sales plummeted for me. Photographers were scared, they were being given complex contracts by Getty and Corbis that required review by real lawyers. Their 50% share of stock sales was being reduced to 40% or even less. Some ASMP members banded together to start their own photographer-owned agency under the umbrella of ASMP, thus guaranteeing it would never fall to the rapacious corporate greedheads. This was super controversial for ASMP with many members opposing it (including me) as doomed to failure. We were photographers, not agency operators. How would this thing work without destroying ASMP in the process? In the end it was created and later failed. It almost destroyed the photographers’ group in the process. Meanwhile others were starting small agencies – the proprietors of the Workbook directory of commercial photographers started an agency which they promised (hand over heart) would never be sold to Getty or Corbis, and lots of photographers signed on. It never was very successful and sold to another agency which later sold out to Getty (or was it Corbis?) So technically that promise to never sell to the giants was honored. But he next owner hadn’t made that promise and GULP! it was swallowed by a great white shark. The publisher of The Gold Book – a directory of commercial photographers – came out with Direct Stock – a paper catalog of stock photography which would be licensed directly from the photographers. I advertised in it and did pretty well. It was a lot of work to respond to inquiries, negotiate licensing and send transparencies, but it worked for a while. They tried producing some CD catalogs, but in the end it was too small in the market for the client base to bother with. It was a time of dramatic upheaval. Stock photography was going from an analog business to a digital one. Catalogs had been behemoth paper monsters with a limited number of images and hard to use for the person looking for an image. For a brief period catalogs were distributed on CD-Roms allowing more images to be distributed, easier searching and instant access to low-res digital comps for the clients. Soon it would all be online, but for now CDs were a huge improvement. I even produced my own CD catalog, and for a brief time I had my own tiny on-line searchable catalog. But the market was demanding big “deep” libraries of images, not specialized small providers. Corbis was a scary beast, owned solely by Bill Gates, the world’s richest man, photographers were wary and scared of this company. Privately owned it wasn’t easy to know much about it, how it worked or what their plans were for us photographers. We were at their mercy and rumors were flying about what Gates wanted with all those photos. It was said that he was building his mansion outside of Seattle with large screen monitors in each room to display artwork – and maybe this was why he wanted the pictures. Corbis went on a buying spree and swallowed up lots of smaller agencies besides The Stock Market including the venerable Bettman Archive of historical photos. They licensed work from museums. It was all to be stored in a super secure underground vault in the middle of nowheresville Pennsylvania. (pdf) It is sort of funny to think that stock photographs were so valuable that they needed to be stored this way. Now it isn’t underground, the most secure place is in the cloud! Agencies disappear like a mandala in the wind. Comstock was gone, Zefa – ciao, bye-bye Photodisc, Westlight, Swanstock…..
And the same time that this consolidation happened, other changes were going on – microstock and royalty-free licensing. A few upstart agencies were licensing images for tiny amounts – a few dollar or even a few cents. Pictures were submitted by all sorts of amateur photographers whose work would never have been accepted by the old-time system. For the agencies it helped them have big catalog and the marginal cost of additional storage was minimal. Royalty-Free stock was easier for clients because they would pay one flat fee and get all the use they wanted. Simpler negotiations of fees, lower costs, but the trade-off was the client never knew where else the same photo might appear. Photographers who resisted R-F were gloating when they learned of some very embarrassing situations where a picture was used by two competitors, or in questionable contexts. In 2007 CNN wrote all about the revolution/evolution. The content providers were told they would make less per picture but they would make it back in volume. This is an old joke from the collapse of the dot-com boom and bust. The sad reality is: no, you don’t make it up in volume, you go out of business. But the damage was done. I saw sales statements go from licensing fees in the thousand$ drop to receiving 25 cents for the use of one of my pictures. My share had been reduced from 50% to 40% and finally down to 25%. Why not stay home and watch TV and lose money instead of licensing my work as stock photography and losing money? I may not be as smart as Bill Gates but I was smart enough to give up on the stock photography business too. Life goes on, even as the stock photography business dies. Perhaps the agencies can make money on this business model but it doesn’t work for content providers. Time to return to creativity.